The fibery queue: half-finished handspun hap (shawl), flax strick from Glimakra, dyed cotton sliver from Chasing Rainbows, and some of my hand-dyed yarn. I adore works in progress—especially of the textile variety. 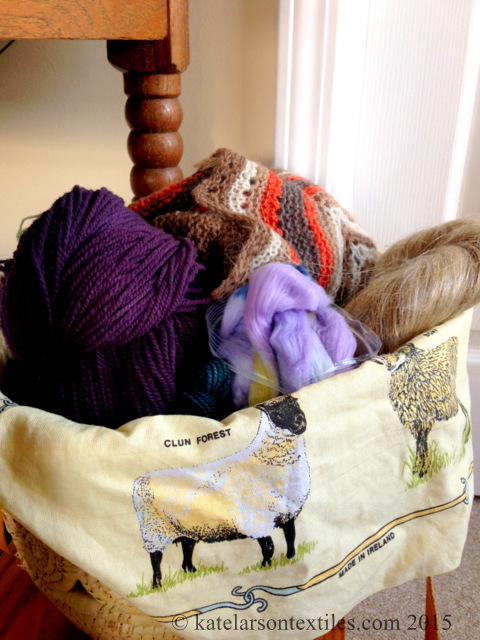 Bits of half-embroidered cloth poking out of a workbasket or unblocked lace laid aside in a knitting bag have so much potential. They have always seemed wonderful to me, lying in their suspended state waiting for the maker’s return.This love of unfinished work is something that I’ve been thinking about this summer. While I was teaching at the Michigan League of Handweavers Conference in early June, I was able spend a bit of time with several instructors I had not met before—such a pleasure! One of the most memorable moments for me was when weaver, dyer, and designer Mary Sue Fenner introduced us to some of the garments she was making using other people’s abandoned projects. The very idea struck me in such a visceral way that I nearly lept out of my chair. I had been walking around the edges of these ideas in my head for years, and Mary Sue’s work gave me a nudge to consider what is special about the sometimes messy journey between cast-on and bind-off. Unfinished Battenburg lace finds a new purpose. Blouse by Mary Sue Fenner. Photo: Kate Larson. Where two tablecloths meet. Blouse by Mary Sue Fenner. Photo: Kate Larson. Tablecloth dyed with steel, coffee, and tea. Blouse by Mary Sue Fenner. Photo: Kate Larson. Over the last ten years or so, I’ve found that teaching knitting and spinning is as much about helping people navigate the learning process as it is about explaining technique. When a panicked knitter hands me needles with the first four inches of her or his very first sweater, the problem isn’t just a dropped stitch, or too many stitches, or a twisted cast-on. We are also coming up against our expectations of ourselves, our disappointments and frustrations, the visions of ourselves creating something beautiful that have for the moment been obscured. There is nothing that gives me more pleasure than smoothing out that path, one dropped stitch at a time. Much of my own work is done on deadlines and in semi-secret for publication, and I get out of the habit of sharing my not-so-secret work as it is happening. So, I thought I would start doing just that. I consider it such a privilege to share in the journey from raw materials to finished textile with so many of you, and I’ll welcome you to share a bit of mine. I purchased this fiber from Betty at Little Shop of Spinning in Fort Wayne, Indiana, several years ago. 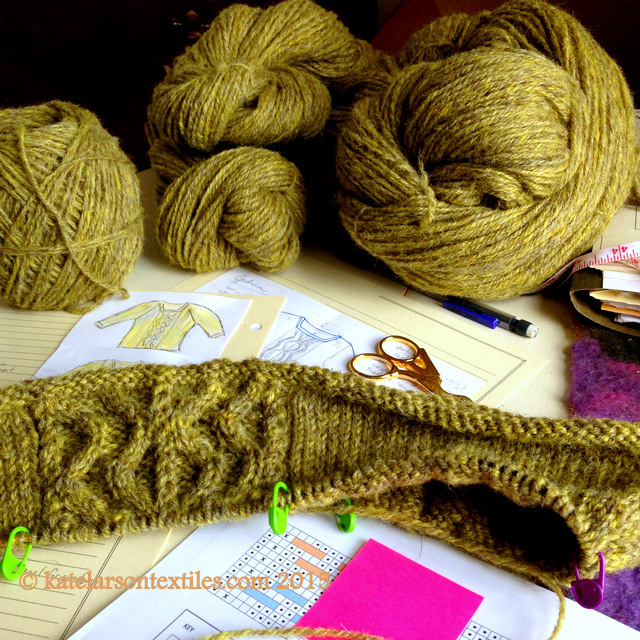 It is a blend of grey wool (something like Shetland, it seems) and Tunis, which was dyed bright yellow. When the two were blended into a roving, the result was a heathered spring green and grey effect. I loved it! I spun it using a woolen draw (long draw) and plied it into a soft 3-ply yarn. Then I fulled the yarn (as in, I shocked it with hot and cold water and agitated it a bit). It was slow to full, so I wasn’t in danger of felting it overmuch. The final yarn will be a nice balance of durability and loft that I wouldn’t have achieved if I had simply added more twist to the fibers. I’m making a fall jumper (sweater) with a few mirrored cables and a squarish neck. At least that is the plan right now—wish me luck!